Together for the first time, a medley of iWin's best original "gems" to whet every appetite! 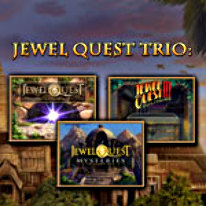 Jewel Quest: The Sleepless Star: Follow the travails of intrepid explorer, Percy Pack, in Jewel Quest: The Sleepless Star. On a quest for a jewel called the Sleepless Star, Pack discovers that the jewel has been stolen from a Native American village by an unscrupulous jewel collector! Along with Percy and a beautiful Algonquin named Yellow Feather, travel to exotic locations on two continents and overcome dangers at every turn, in an effort to recover the jewel. Solve over 200 jewel board puzzles, including never-before-seen obstacle puzzles! Progress through a beautifully illustrated and fully voice-acted story that includes collectible power-ups and quest options filled with your favorite classic Jewel Quest games. Jewel Quest Mysteries: The Seventh Gate: The hit hidden object series is back, and it's better than ever! Venture through the hidden relics of Greece as you join Emma in search of her husband and daughter, who have fallen victim to a horrible struggle. They began their journey to uncover the mysteries of the famed jewel boards of ancient Greece. Emma must find her missing family before the impending volcanic eruption that will put all of their lives in peril. Don't miss out on this exciting and dangerous adventure that is unlike any other! Jewel Quest Solitaire III: Rupert and Emma's friend, Ratu, has discovered a valuable tablet in the ruins of an ancient civilization. Little does he know that this find is just the beginning. When his beloved assistant Yumi is abducted, Ratu is propelled into a treacherous game of cat-and-mouse with a gang of dangerous thugs. Travel with Ratu in this Jewel Quest Solitaire sequel, and experience compelling Solitaire layouts and addictive new Jewel Quest boards. Fresh features and power-ups, plus 100 boards of combined play, will make Jewel Quest Solitaire III feel brand new again!